Every single day. Every moment. Every ounce. It can be exhausting. The smile is often from a place that you’ve prayed for because, on your own, you couldn’t have managed to muster it up. Today it’s different. Today you feel like you just want to feel. And you know what? It’s okay. We are taught to smile, be a light, spread happiness and all the other fluffy words you can put together to describe the one emotion that is encouraged by many but felt by few. Happiness [joy] is the acceptable emotion. It’s the only one that people aren’t trying to talk you out of day in and day out. When you lose someone you love, you are encouraged to remember the good times. When all else fails, you are told to look at the bright side. It’s a constant battle to ward off the emotions that bring about things that can be perceived as negative. We tip-toe around our emotions because, quite simply, we are told it isn’t okay to not be okay. We wear ourselves out trying to do everything we can to not feel how we feel. Simply reading about anything other than the good stuff might even be taking your mood from one of anticipation to a little down at this very moment. You’re used to reading the good stuff to start your day off right and here we are, discussing emotions you’d rather not feel. Some of those words make you cringe, don’t they? The same few are considered sinful. We try so hard to be “ok” that we don’t even know what is okay to feel anymore. What if I told you that what you’re feeling [right now] is perfectly normal? How someone or something made you feel is okay. You aren’t determined by your feelings. To be quite honest, it isn’t even about your feelings at all. It’s what you do with those feelings that’s the important thing. You can’t allow your emotions to take a piece of your peace. So what are we to do with these emotions? First and foremost, we mustn’t allow our emotions to dictate our actions. What someone else says or does may make you feel a certain way, but you are in charge of what you do with those feelings. You are ultimately the controller of the very emotions that you have a tendency to let control you. It’s empowering to know that what we feel is okay as long as we can redirect our thoughts and determine our actions based on Godly truths such as we were made for more. There’s Point A and Point C. Point A represents our feelings/emotions. Point C refers to our actions. We tend to forget Point B but what’s in between does count. It’s what takes us from how we feel to what we do. It’s how we get to the part where we determine our actions. What we do in between can bring about a completely different action or reaction depending on the situation. It’s okay to be less than joyful but it’s not okay to be the only guest at a self-induced pity-party that lasts for weeks. When certain thoughts creep into your head, thoughts that are shameful or even confusing, what you do next will determine how or even if you will act on them. If you dwell on those feelings, hypothetically sinking your teeth into them, you may as well call it a day. When we give in to our feelings and let them take control, we are essentially saying no to the God-given strength that lies waiting for our acceptance. We are trying to do it on our own when our Heavenly Father is equipped to manage those very things for us. 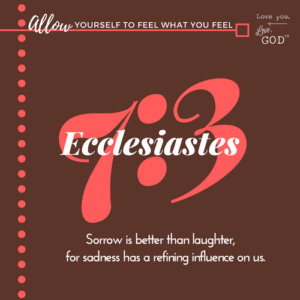 Ecclesiastes 7:3 says Sorrow is better than laughter, for sadness has a refining influence on us. We are able to learn despite the emotions that are often perceived as negative and take something positive from difficult situations. 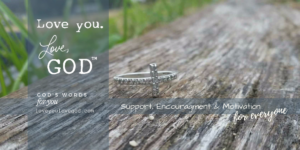 It’s a reminder that God is with us in the difficult times, through the tough emotions and onto what’s next. We mustn’t take our eyes off Him in the process. He’s in the mess with us. He gave us feelings for a reason, but so we could experience Him, call on Him, rely on Him; not so that we could stay in a state of confusion with a dim-lit light and hope that something will give. He is our light. He will guide, provide and help us gather our thoughts when we invite Him in. So while you may not be feeling quite like yourself, know it’s okay to not be okay for a bit. Heed the process. Remember the steps from Point A to Point C require choices in between that will ensure our actions aren’t a direct reaction to how we feel or have felt. Allow yourself to feel what you feel but then use the tools God has given you to take action in a positive way. Use self-control to direct your thoughts in such a way that what you gain is what you recall — not anything you may have lost. Our God is so good. He has shown us in so many ways what it important and how to live a life that qualifies us. Hear that friends, you are qualified because you are equipped with the tools you need to succeed and far surpass the goals you have for yourself. You are chosen by God to do and be so much more than you could ever on your own. Seek Him in every situation, with every emotion and you will reach Point C with praise and thanks.